This post was not planned, but resulted from the direction my mind wandered as I was cleaning up the mess I made when I cooked a spaghetti dinner for me yesterday, washing the pots and pans and dishes that I do not put in the dishwasher. Doing dishes is a good time for thinking – I guess most housework is a good time for thinking, because it doesn’t require a whole lot of concentration. 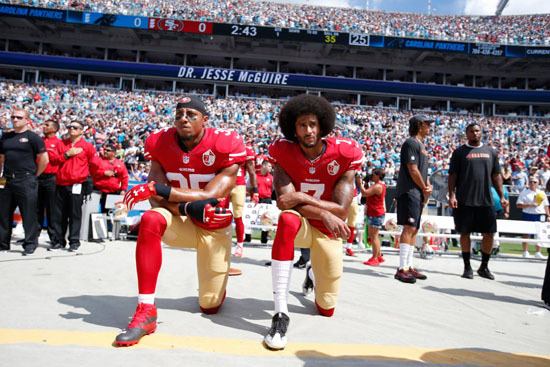 This morning’s thoughts were prompted from divergent opinions expressed by people I care about on the topic of the athletes kneeling during the national anthem, and the subsequent posts that appeared on Facebook as a result. The specific post compared the salaries of the armed forces that fight for our freedoms, and professional athletes in this country – we all know who is underpaid in this country, and it’s not just the military personnel, but that’s not what I want to talk about today. I confess to finding this action disconcerting, and am not sure whether it’s appropriate for the cause they are supporting. BUT, is it truly disrespectful of our flag, of our country, or is it celebrating the freedoms we have in this country – the freedom to speak about things we care about, to demonstrate our support of causes that matter to us? And really, what do salaries have to do with it anyway? I recognize that professional athletes have chosen short-term careers, but I also recognize that most of them go on to positions that pay very well once they reach the age, or their body reaches its limits, and I do not disagree that their salaries are excessive. But so are the salaries of many of the CEOs of corporations and many organizations, and so are the salaries of celebrities. The military, the men who put their lives on the line, are not compensated as they should be. Okay, we all agree on that. Or at least I think most of us agree on that. But how does that relate to kneeling in support of their cause? At least that action is non-violent. Are we overly sensitive to slights, imagined or otherwise, these days? Do we look for ways to be offended? Could we be more generous, like we are with the uncle who tells the same stories every holiday, or the codger who grumps about everything? The people we know that elicit a response of “well, that’s just Henry, you know”, and then we go on with our lives without being overly offended? Annoyed, maybe, but not protest-volume offended. I don’t know. I really don’t know. What I do know is that I’m weary of all the anger, the vitriol, the inability to accept differences of opinion. I’m weary of our apparent inability to recognize that most of us have enough, to appreciate what we have – including the freedom to express our differing beliefs. If we want to get upset, why don’t we get upset about the inequalities in this country, and then act upon our feelings. Maybe that’s what those athletes are doing. At least some of them are also putting some of their money where their mouth is. I love this country. I do not love everything about this country though, anymore than I love everything about the people I love. Live with it. I am weary, too, Carol. It’s unfortunate the way things have turned. Everything is so divisive lately, and so much of what we should be talking about goes untalked about because we are misdirected by other things (comparing apples and oranges, for example, by bringing salary into the mix). I think (and it’s only my opinion) that what the athletes are doing is a respectful way of protesting. I’ve listened to what Colin Kaepernick had to say about what he is doing, and he is respectful of our troops while trying to right an injustice. Even if that were not the case, there is always the issue of free speech which, I suspect, this falls under. “I am weary of…..the inability to accept differences of opinion.” Gee whiz, why does an opinion seem to automatically illicit an argument? It is sad, isn’t it? I don’t know either, Carol. But there is no where else I would rather be. Have a good one, my friend. Only people who have nothing creative to do marinate in artificial issues. Comes of having too much time in hands and too few needs gone unmet. Ever seen a human being in the middle of a famine or war ravaged nation do this? Ignore and move on, you and I have better things to do. If not anything we have our writing and our paintings to consume us. I was possessed, then remembered the right to protest and applauded the effort because it at least started a national discussion. Where I lost support again, of specifically Colin Kapernick, is when I learned that he didn’t vote. WTH? I understand the frustration with a “lesser of 2 evils” system but there was a LOT of other stuff on the ballots too. Voting the main way to create change and he didn’t even exercise it?!? I see little point in demanding change but refusing to participate in an existing process which would at least support change. But his protest, not mine. And his right. oohhh… I support his attempt to bring attention to racial issues via the kneel. I didn’t know about the severely mis-stated Castro remark (meant to say he admired/appreciated that Castro invested more $$ in education than prisons [common complaint out & about is that US spends more on jailing people than on educating them] but came out alllll wrong, like he supported everything Castro did). I agree with your frustration about many of the current events. Disrespecting our nation’s flag/anthem is nothing new. And, like it or not, it is their right to do so. I think what irks most people is the hypocrisy behind Kapernick’s actions in that he was/is the recipient of the benefits of living in this country yet, he comes across as being disrespectful and unappreciative of the country that has offered him so much opportunity. My opinion is if you don’t care enough to vote, you cannot complain. I’m tired of the vitriol that is spewed about every little thing people disagree with as well. Should we give president-elect Trump a chance? Of course. Should we be outraged at all the fake news stories circulating about both sides? Of course. It’s sad that common courtesy and decency seems to be passé these days when it comes to things that people don’t like to hear/see/think.